Our 1987 Club Car uses 6 volt golf cart batteries, providing our golf cart with plenty of power and longevity. With a batter pack of six , this means that the combined voltage from each of the 6V golf cart batteries makes up the total golf cart voltage - which gives me a total golf cart voltage of 36. How do you know if your batteries are 6, 8 or 12 volts? By looking at the cell holes. There are two volts per hole. As you can see from this picture, there are 3 white holes where water is added. The three holes mean that it is a 6 volt battery. The power and longevity of the 6 volt battery has served us well these 15 years. Playing 36 holes of golf on one charge is no problem. Or using it to get across town. The total golf cart voltage of 36 provides plenty of power for going uphills and a long enough charge to get us any where we need to go. Of course it is important that the cart is fully charged and that the batteries are receiving regular golf cart battery maintenance. If you are needing to replace your 6 volt batteries, you need to replace all of them. 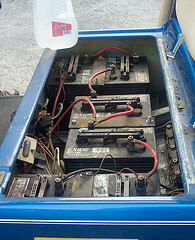 If you replace just one 6 volt golf cart battery the weaker batteries will drain the new battery. So instead of saving you money, it will actually cost you more because you've greatly shortened the life of the new battery. Buy your batteries for your golf cart from a local dealer or from places like Batteries+Bulbs. I just checked on line to see if the prices for batteries were competitive. The average local price for a 6v golf cart battery was around $85 per battery, but on line they were anywhere from $150 - $200 per battery. You will know when it is time to replace your batteries by the charge. When the charge doesn't last as long as it did before or you can't go as far on a full charge it's time to start shopping around. Prices in Peachtree City ranged from around $600 to $800 for six 6v golf cart batteries. Installation costs ranged from $20 - $65. 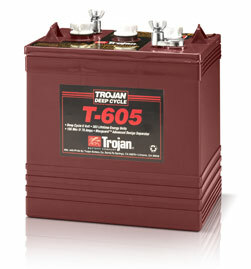 Five out of the 6 golf cart dealers in our golfing community use the Trojan batteries. They all stated that they performed better and lasted longer than the Exide golf cart batteries. I was told by one dealer that if the Trojan golf cart batteries are well maintained using only distilled water, you may see them last 6-8 years. But another dealer said you can expect a 4-5 year battery life with Trojan. 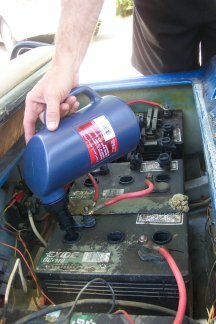 Either way this deep cycle battery is a favorite in our golf cart community. One golf cart dealer who uses only Exide golf cart batteries says his customers have been happy with Exide and that they have a better warranty than Trojan batteries. We have the Exide batteries in our golf cart and have had them for 5 years. They are still working fine and keep a good charge. The performance and longevity of your deep cycle batteries depend more on maintenance, proper charging and a good water maintenance program. 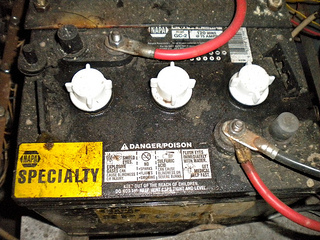 The secret to long lasting golf cart batteries, is to provide regular golf cart battery maintenance. Especially during the long, hot summers in Georgia. I get a golf cart battery maintenance kit that includes a watering bottle, a battery terminal cleaner, and a battery terminal protector. The leaded plates in the battery must be submerged in order for it to work properly. If you use it several times during the week, especially in hot weather, check the water level once a week. Wear gloves and goggles. Your owner's manual will tell you how full the cells should be for your golf cart model. This charger is for an EZGo cart and EZ-Go has the 2 pin "D" shaped 36V Connector - so be sure the plug matches your cart before you place an order. If you need a golf cart battery charger for your 6 volt golf cart batteries, you will need to look for one that says 36 volt. This EZ-Go 36 volt 18 amp Accusense Intelligent charger with Powerwise Handle was made in the USA by Diversified Power International. 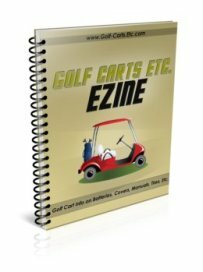 It is for the EZGO TXT 1996-Up 36 volt golf carts. The battery pack must have at least 32 volts in the pack for the charger to work. It will not turn on if batteries are completely discharged. Three Year Limited warranty through the manufacturer: The manufacturer, Diversified Power International LLC (DPI) warrants exclusively to the original purchaser that chargers will be replace or repaired , at DPI’s option, if it fails during the first three years after date of purchase due to defect in material or workmanship. Charge the batteries after every use. Many battery chargers are fully automated which means that they automatically shut off when the charge is full so there is no danger of overcharging.